These 72 high-quality crosswords will engage solvers and challenge their mental agility. Looking for solving fun? 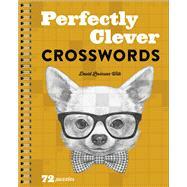 These easy- to medium-level crosswords feature plenty of inventive wordplay and mind-tingling themes. Created by top puzzle constructor David Levinson Wilk, they’re playful, with a sense of humor, and provide a mental workout without being bone-crushingly hard. And, as a bonus, you won’t find the usual clues about obscure rivers and dictionary definitions that can make some crosswords so frustrating. David Levinson Wilk is the author of self-syndicated crossword puzzles that appear in weekly newspapers across the country. He is also a puzzle contributor to The New York Times and the Los Angeles Times, among other publications. He was a staff writer on Who Wants to Be a Millionaire for nine years and worked on game shows that have aired on ABC, CBS, and NBC.